When Doris and Delilah wake up to find something strange and sparkly has fallen from the sky, they are inspired to put on the world’s greatest magic show! But HOW do you make real magic happen? What ingredients do you need and who can help them? Along the way they encounter some fabulous characters, from a transformative moth, a giant singing frog, an artistic spider and a rather grumpy stick insect to some beautiful fireflies who all help to create their dream. Are you ready? Grab a spoon! Because it’s Pat-a-cake time! Pitter-patter – get the butter! Glitzy-glossy – whisk in sugar! Jokey-yolky – add the eggs! Long Nose Puppets offer up a marvellous moonlit show full of riotous rhyme, zany puppets and spiffy special cake; all iced with music and songs by Tom Gray. Little children will feel stuffed to the brim with magic. Pat-A-Cake Baby was launched in 2016. The show is aimed at 2- 7 year olds, but fun for all the family. Running time is 40 minutes plus 15 minutes ‘Meet the puppets’. Shoe Baby is a magical puppet show! A fantastical sing-a-long adventure with a baby who takes to the sea, the air, the zoo all in a shoe! Shoe Baby is adapted from the book written by well known author, Joyce Dunbar, published by Walker books. ​The music is written by talented musician, Tom Gray of the award winning band Gomez. The show is aimed at 0- 5 year olds, but fun for all the family. Flyaway Katie is an inspiring flight of fancy about the power of imagination based on the popular children's book by Polly Dunbar with music by Tom Gray of Gomez. Katie is all alone and feeling grey. The birds in the picture on her wall look so colourful-if only Katie could be as bright as them, who knows what might happen? The show is bursting with colour, movement and surprises, with puppets of varying scales acting the story. The show is aimed at 1-5 year olds. ​Running time is 40mins plus 15 mins ‘meet the puppets’. Long Nose Puppet’s show PENGUIN is based on the award-winning book by Polly Dunbar. Ben is delighted when he rips open his present, inside is a penguin. "Hello Penguin!" says Ben. Penguin says nothing. Ben tickles Penguin; he pulls his funniest face; he puts on a happy hat, sings a silly song and does a dizzy dance. Penguin says nothing..so Ben fires Penguin into OUTER SPACE, Penguin comes back to earth without a word! It isn't until a passing lion intervenes that Penguin finally speaks...and when he does, Ben discovers something that was really worth the wait. Penguin is exiting, surreal and full of surprises. The lively songs by Tom Gray of Gomez will have everyone joining in! It’s a spectacular theatre experience for all ages-especially 2-7 year olds. Based on the book by Polly Dunbar and brought to you by Long Nose Puppets with music by Tom Gray, of the Mercury Award winning band Gomez. ​It is the story about a little boy who has a dream. One night, Arthur has an amazing dream about a beautiful pink and green boat with a stripy mast. He can't wait to tell everyone about it but no one (not even his dog!) is interested. In fact, they don't even notice that this very same boat is growing on his head, getting larger and larger by the minute! Soon, Arthur is bouncing along the waves in his very own dream boat. Maybe now his family will listen to him! 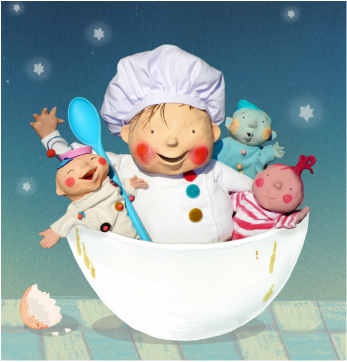 A magical playful children's show with breathtaking puppets, so enchanting that everyone will want to sail away with Arthur's in his dream boat! The show is aimed at 2- 7 year olds, but fun for all the family.